(15 DOCTORS OF INTEGRATIVE AND NATUROPATHIC MEDICINE TELL YOU HOW). 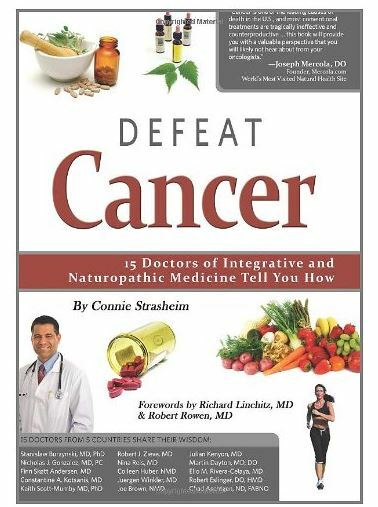 In her book (released May 2011), author and medical researcher Connie Strasheim provides the reader with an informative overview of some new and innovative cancer treatments. She identified 15 top cancer healers from the United States and five other countries and then spent the better part of the 2010 interviewing them. The 15 physicians interviewed included medical doctors, osteopaths and naturopaths who treat cancer either exclusively or as a major part of their practice. Most people, when confronted with cancer in our society, are quickly shunted into typical surgery, chemotherapy and radiation protocols. Standard medical treatment offers little variation from person to person, and after chemotherapy or radiation, patients are left with impaired immunity, toxicities, fatigue and emotional uncertainty. As substantiated by several of the doctors in the book, these conventional treatments don’t have a great long-term track record despite all the money spent on cancer therapy and research. Strasheim’s interviews with these fifteen different doctors focus on integrating the best conventional wisdom with nutritional supplements, Traditional Chinese Medicine, diet, lifestyle and a wide variety of modalities that help balance body, mind and spirit. Although each doctor employs his or her own set of techniques and protocols, the reader soon understands that there are some common themes among their approaches. The doctors interviewed present a solid perspective on what options are available to a person facing cancer. They have been trained in a variety of medical disciplines including, but not limited to, allopathic (conventional), naturopathic, homeopathic, biological, and Traditional Chinese medicine. Some of the tools like Insulin Potentiation Therapy (IPT) and specific tumor drug testing (chemosensitivity tests) make so much sense that it is a pity they fall short of the “Standard of Care” procedures followed by the medical establishment. There is a wealth of information for anyone who is interested in pursuing a kinder and gentler cancer therapy. Each chapter of the book focuses on the treatment approach of a single physician. All aspects of treatment are covered, from anti-neoplastic (anti-cancer) remedies and immune system support, to dietary and lifestyle choices that result in the best outcomes for patients. The book also offers unique insights into healing, such as the pros and cons of different treatments and how to intelligently use chemotherapy. It discusses patient and practitioner challenges to healing, factors that affect healing, treatment outcomes and how to effectively combine multiple medical strategies to obtain the best results. Finally, it offers helpful insights to the friends and families of those coping with cancer. What is cancer? What causes it? What is your treatment approach? How effective is it for different types and stages of cancer? What are your treatment outcomes and can you provide statistics on your success for treating late-stage cancers? What are your dietary recommendations for those with cancer? What lifestyle recommendations do you suggest for people with cancer? Describe the role of emotional trauma/emotions in healing from cancer. Do you recommend that your patients do any type of spiritual/psychological therapies as part of their healing process? How integral are these to their healing? Do you recommend detoxification therapies to your patients? If so, which ones? What supportive treatments do you recommend, besides those described in your main protocol? Do you believe that supporting the hormones, for example, should be an important part of treatment? How can friends and family support their loved ones with cancer? What do you wish that more people with cancer knew when seeking out treatments? How does medical politics influence the availability of effective treatments? What else do you want readers to know about your work as a cancer practitioner? What are your final words of wisdom for cancer patients? Chad Aschtgen, ND, Seattle, Washington. 6) KNOCKOUT: INTERVIEWS WITH DOCTORS WHO ARE CURING CANCER by Suzanne Somers. Besides the above (which your doctor/oncologist will advise you not to read), there are many other books on complementary and alternative healing modalities for cancer. But invariably, your doctor/oncologist will gun you down if you ever mention any of them….not scientifically tested, proven, etc, etc, etc. Amen.